Li, P., Wang, Y., Hou, Q., Liu, H., Liang, C., and Li, X. (2019). "Effect of pretreatment on the structure and properties of nanofibrillated cellulose from soybean residues," BioRes. 14(1), 554-560. Soybean residues were pretreated with 6% of HCl and NaOH, respectively, and then nanofibrillated cellulose (NFC) was prepared using the high pressure homogenization method. The effects of different pretreatment methods on the structure, properties, and NFC preparation of soybean residues were studied. Analysis of the X-ray diffraction, specific surface area, porosity, and thermal stability showed that pre-treatment of the soybean residues allowed the basic crystallinity to be maintained. Specific surface area, porosity, and thermal stability increased. Acid treatment led to the greatest increases. The soybean residues were treated with 6% hydrochloric acid at 80 °C for 1 h, and homogenized 15 times under a pressure of 60 MPa to obtain NFC. Nanofibrillated cellulose (NFC) is a material composed of nanosized cellulose fibrils. The typical diameter of a fibril is 5 nanometers to 100 nanometers, and the fibril has a wide range of lengths, typically several micrometers. NFC is also called cellulose microfibrils or microfibrillated cellulose, because it is usually an irregular mesh composed of the linear microfilament with a high aspect ratio (length to width ratio) (Zhou et al. 2014). Due to its high mechanical strength, special optical and high barrier properties, and excellent biocompatibility and biodegradability, NFC has extensive prospects for application in bio-nanocomposites, paper and paperboard, medicine, hygiene and absorbent products, emulsion and dispersion, and other applications (Lavoine et al. 2012; Missoum et al. 2013; Nyström et al. 2015). Soybean residues (SR), an agricultural waste, is produced during the processing of soybean products and remains after the water-soluble fraction is filtered in the making of soymilk and tofu; soybean residues contained 72.1% holocellulose, 64.3% α-cellulose, 16.4% protein, 6.2% fat, 3.3% ash, and 1.1% lignin (Li et al. 2018). Soybean residues have higher α-cellulose and lower lignin than wood pulp, so they have potential to be used in the preparation of ecofriendly cellulosic nanofibrillated. In this study, hydrochloric acid and sodium hydroxide were used to hydrolyze the soybean residues, and then NFC was extracted from soybean residues by high pressure homogenization. The effects of different chemical treatments on soybean residues were investigated by the morphology, specific surface area, crystallinity index, and thermos stability. Different techniques were employed to characterize the fibers and NFC of soybean residues. Soybean residues were supplied by a soymilk mill (Heilongjiang, China) and were passed through a 40-mesh screen, and then dried to 4.6% moisture. Petroleum ether, sodium hydroxide, sodium chlorite, and glacial acetic acid was purchased from the Tianjin Damao Chemical Reagent (Tianjin, China). Analytical grade hydrochloric acid (36% to 38%) was obtained from the Sinopharm Chemical Reagent (Beijing, China). Protease was purchased from Shenzhen Leveking Bio-Engineering (Shenzhen, China). Initially the 2 g soybean residues (SR) were wrapped in filter paper and were treated with petroleum ether at 50 °C for 8 h to remove the fat, followed by air-drying. Then, the fibers were treated with protease of 1.5% (w/w) and pH 7.2 phosphate buffer (liquid to liquid ratio of 1:20) at 50 °C for 2 h under mechanical stirring. After this treatment, the fibers were collected by vacuum filtration, and were freeze-dried for 12 h.
After pretreatment, the dried soybean residues fibers were reacted with HCl or NaOH. The hydrolysis was performed using 6 wt% hydrochloric acid at 80 °C for 60 min and 6 wt% sodium hydroxides at 60 °C for 60 min under vigorous and constant stirring, respectively. After this treatment, the suspension was washed with distilled water until the filtrate reached a neutral pH, and then the sample was freeze–dried for 12 h. The solid material that remained after the extraction was the hydrochloric acid treated soybean residues (HCl-S) or sodium hydroxide treated soybean residues (NaOH-S). Subsequently, the resulting suspension of HCl-S or NaOH-S was treated using a high-pressure homogenizer of 1% (w/w) at 60 MPa. NFC samples were collected after 15 passes, then, were freeze–dried 12 h. The nanocellulose of soybean residues were labeled HCl-S-15 or NaOH-S-15 depending on the hydrolysis condition. The crystalline phases of SR, HCl-S, and NaOH-S were investigated by using a D/max 2200PC powder diffractometer (Rigaku, Tokyo, Japan). Radial scans of intensity were recorded at ambient condition over scattering 2θ angles from 5° to 60° (step size = 0.02, scanning rate = 2 s/step) using a Ni-filtered Cu Kα radiation, an operating voltage of 45 kV, and a filament current of 40 mA. The crystallinity index (CrI) of each sample was calculated by referring to diffraction intensity of crystalline and amorphous regions using the following empirical equation (Segal et al. 1959). The samples were dried and ground, and then passed through an 80-mesh screen. Specific surface area and pore properties of the fibers were evaluated by surface area analyze (BET). The samples were degassed at 80 °C for 2 h and the specific surface area, total pore volume, and average pore diameter were measured using a fully automatic fast surface area and porosity analyzer (Gemini VII 2390, Micromeritics, USA). Thermal stabilities of SR, HCl-S, and NaOH-S were evaluated by thermogravimetric analysis (TG-DSC) using STA449F3-1053-M equipment (NETZSCH, Selb, Germany). The analysis conditions were a nitrogen atmosphere with a flow of 40 mL·min-1, heating rate of 10 ℃·min-1, at 25 ℃ to 600℃, and a sample mass between 3 mg and 5 mg.
A scanning electron microscope (SEM) was used to characterize the morphology of SR, HCl-S, NaOH-S, HCL-S-15, and NaOH -S-15. After freeze-drying, the fibers were affixed to metal stubs using double-faced tape, and the surface was coated with gold using an ion sputter instrument. Images were recorded using a scanning electron microscope (S-4800, Hitachi, Tokyo, Japan), and analyzed by Nano Measurer software (Department of Chemistry, Fudan University, Shanghai, China). Comparison of the acid and alkali treatments revealed that the optimum process for acid treatment was an HCL concentration of 8%, reaction time of 80 min, reaction temperature of 75 °C, and a yield of soybean residue cellulose of 78.75%. The optimum process for alkali treatment was an NaOH concentration of 6%, reaction time of 60 min, reaction temperature of 60 °C, and a yield of soybean residues cellulose of 49.5%. The XRD patterns of SR, HCl-S, and NaOH-S are displayed in Fig. 1. In the case of SR, these crystalline domains were emended in the matrix of amorphous components like hemicelluloses, lignin, fat, and protein; thus, a low crystallinity index (14.6%) was shown. After purification and chemical treatment, the crystallinity of HCl-S and NaOH-S samples increased by 3.71 times (54.2%) and 3.36 times (50.6%), respectively. This was attributed to the effective removal of the non-crystalline components. Alkali treatment caused the dissolution of the amorphous hemicelluloses and lignin. Their removal helped in realigning a significant portion of the crystalline domains. However, the acid treatment removed non-cellulosic materials and disrupted hydrogen bonding in the cellulose structure, causing an increase in the crystal surface area and reducing the amount of certain proteins and fat that covered the outer surface of the fiber cell. This was possible because the hydronium ions can penetrate into the amorphous regions, promoting the hydrolytic cleavage of glyosidic bonds of cellulose and thus releasing individual crystallites (Park et al. 2010). The Specific Surface Area (SSA), Total Pore Volume (Vp), and Average Pore Diameter (dp) of the SR, NaOH-S, and HCL-S are listed in Table 1. The SSA of the NaOH-S and HCL-S increased 14.3% and 41.8% more than that of the SR (1.443), respectively. The Vp and dp showed similar trends, which indicated that the chemical treatment significantly affected the surface structure of the soybean residues. This was due mainly to the removal of the non-cellulosic materials during the chemical treatment and an increase in the interspace of the SR. Similar behavior was observed when comparing the samples NaOH-S and HCL-S; these enhancements in SSA, Vp, and dp were connected to the removal, not only of the non-cellulosic materials, but also to the amorphous phase and the partial destruction of the cellulose crystalline regions. However, the SSA of HCL-S was approximately 1.24 times higher than that of the NaOH-S, and the HCL-S had a higher total pore volume (6.006) and average pore diameter (16.00) than the NaOH-S (3.968 and 14.45), respectively. This was due to the higher amount of hemicellulose that was dissolved after acid treatment. The internal structure of the soybean residues became looser, which was conducive to the formation of regularity molecular arrangement crystal. Therefore, the crystallinity of HCL-S increased (Guo et al. 2016). This was consistent with the results of XRD analysis. Thermogravimetric (TG) and derivative thermogravimetry (DTG) curves of the SR, HCL-S, and NaOH-S are shown in Fig. 2. The initial degradation temperature of HCL-S (260 °C) and NaOH-S (213 °C) was appreciably increased compared to that of the original SR (210 °C). However, the degradation temperature of NaOH-S was lower than that of HCL-S. This lower degradation temperature could be attributed to the hemicellulose component of SR, which remained in greater amounts after the alkali treatment than after the acid treatment. Hemicellulose was located within and between the cellulose fibrils. This strong association between hemicelluloses and cellulose fibrils was believed to decrease the crystallinity of the cellulose fibrils and accelerated the beginning of the thermal degradation process (Deepa et al. 2011; Sheltami et al. 2012). At higher temperatures, a sharper weight drop was observed. The DTG of SR showed two broad exothermal peaks, one at 268 °C and another peak at around 301 °C. The degradation of alkali-treated soybean residues started at 203 °C, and the maximum rate of degradation was reached at 307 °C and 345 °C owing to the decomposition of cellulose; whereas for acid-hydrolyzed soybean residues, degradation started at 260 °C and a peak at 354 °C corresponded to the maximum rate of degradation. The rise in the onset temperature of degradation of acid hydrolyzed soybean residues was due to the removal of non-cellulosic components and caused an increase in the crystallinity, which made the cellulose denser and more compact (Li et al. 2018). 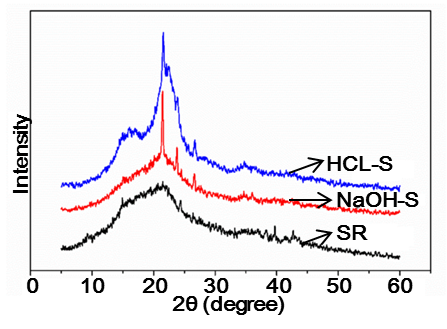 Compared to NaOH-S, it was observed that the HCl-S induced an increase in the material thermal stability. The higher thermal stability of acid treated compared to the alkali treated soybean residues was attributed to the partial elimination of non-cellulosic material and degradation of some part of the cellulose. These factors decreased the amorphous cellulose and increased the crystallinity. 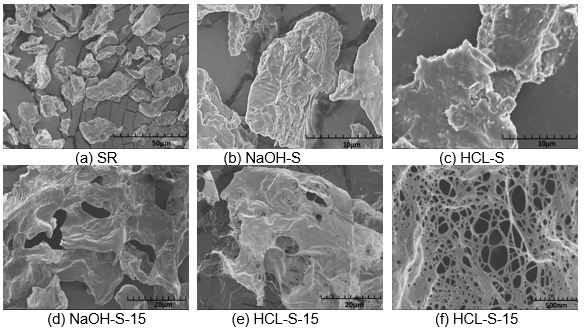 The microstructures of SR, NaOH-S-15, and HCL-S-15 are shown in Fig. 3. The untreated soybean residues had a rough surface, and many impurities and fragments could be seen. After alkali treatment or acid treatment, the soybean residues surface became smooth, and the morphology of soybean residues was that of a parenchyma cell instead of fibrous cell. This could indicate the partial removal of the outer non-cellulosic layer composed of materials such as hemicelluloses, lignin, fat, and protein contained in the soybean residues, shown in Fig. 3b and c.
These binding materials were removed, and thereby fibers were detached from the surface by the alkali treatment. Figures 3d and e represent the alkali treated and acid treated sample, respectively, after homogenization. After treatment with high pressure homogenization, the cell walls of soybean residues were further damaged, and the morphology of NaOH-S and HCL-S was noticeable altered. Following homogenization, the sheet structure of NaOH-S was damaged, and the surface of NaOH-S created cracks and holes; nevertheless, there was no NFC produced from homogenization. However, the cell wall of HCL-S was destroyed by homogeneous treatment. Fig. 3f presents a nanoscale network structure, which confirms that the isolation of NFC from soybean residues was successful by acid hydrolysis and homogenization. Through homogenization, the cell wall will be dissociated from the edge to the interior and from the outer layer to the inter layer. Weaker stress position and a looser cell wall structure allows for the fiber to be dissociated by homogenization more easily (Zhu et al. 2017). Partial removal a small amount of hemicellulose from the fibers by acid treatment resulted in a loose cell wall structure, thus generating some weak points for the subsequent fibrillation. The analysis of the specific surface area and porosity of HCL-S and NaOH-S showed that the pore size of HCL-S was larger than that of NaOH-S, which resulted in a looser cell wall structure and weaker stress of HCL-S. These had advantages in the preparation of NFC by homogenization. In addition, the purity of cellulose in HCL-S was higher than that of NaOH-S, which is another benefit for extraction of the NFC by homogenization. Following the pretreatment of agricultural waste soybean residues by acid and alkali methods, different soybean cellulose was obtained for each method. The crystallinity, thermal stability, specific surface area, and porosity after pretreatment were increased compared with the raw materials. Compared with the alkali treatment, the cellulose of acid-treated soybean residues had higher purity, larger specific surface area, and a looser structure. Therefore, the acid-treated bean dregs could more easily NFC through high-pressure homogenization treatment. The authors are grateful for the support of the China Scholarship Council and the financial support from the project of Shaanxi Provincial Department of Education Key Laboratory Research Open Fund, Grant No. 17JS017, the Project of Guangxi Clean Pulp & Papermaking and Pollution Control Key Laboratory Open Fund, Grant. No. KF201721, and the project of Shaanxi University of Science and Technology Research Initial Fund, Grant No. BJ15-29. Lavoine, N., Desloges, I., Dufresne, A., and Bras, J. (2012). “Microfibrillated cellulose–Its barrier properties and applications in cellulosic materials: A review,” Carbohydrate Polymers 90(2), 735-764. DOI: 10.1016/j.carbpol.2012.05.026. Li, P., Wang, Y., Hou, Q., and Li, X. (2018). “Isolation and characterization of microfibrillated cellulose from agro-industrial soybean residue (okara),” BioResources 13(4), 7944-7956. DOI: 10.15376/biores.13.4.7944-7956. Nyström, G., Marais, A., Karabulut, E., Wågberg, L., Cui, Y., and Hamedi, M. M. (2015). “Self-assembled three-dimensional and compressible interdigitated thin-film supercapacitors and batteries,” Nature Communications 6(7259). DOI: 10.1038/ncomms8259. Segal, L., Creely, J., Martin Jr., A., and Conrad, C. (1959). “An empirical method for estimating the degree of crystallinity of native cellulose using the X-ray diffractometer,” Textile Research Journal 29(10), 786-794. Article submitted: September 28, 2018; Peer review completed: November 5, 2018; Revised version received: November 17, 2018; Accepted: November 22, 2018; Published: November 28, 2018.